We’d love your help. Let us know what’s wrong with this preview of Moving Target by Cecil Castellucci. Reeling from their disastrous defeat on Hoth, the heroic freedom fighters of the REBEL ALLIANCE have scattered throughout space, pursued by the agents of the sinister GALACTIC EMPIRE. One rebel task force protects PRINCESS LEIA, bearing her in secrecy from star to star. As the last survivor of Alderaan's House of Organa, Leia is a symbol of freedom, hunted by the Empire she has opposed for so long. To ask other readers questions about Moving Target, please sign up. A look at one of Leia's missions between Empire Strikes Back and Return of the Jedi. I quite liked the characterization of Leia and her crewmembers are pretty interesting too. As is pointed out several times in the story, they are fighting a war and that means a lot of tough decisions, and I think this book did a good job of portraying that (while staying acceptable for its middle grade/YA target audience). I totally bought this on release day just to do my part for "Hell yeah Leia is awesome ple A look at one of Leia's missions between Empire Strikes Back and Return of the Jedi. I quite liked the characterization of Leia and her crewmembers are pretty interesting too. As is pointed out several times in the story, they are fighting a war and that means a lot of tough decisions, and I think this book did a good job of portraying that (while staying acceptable for its middle grade/YA target audience). I enjoy Star Wars books, but this one was not one of my favorites. I did the audio and usually that is a plus for these books, but I didn't care for the narrator. She couldn't quite get the voices down. The story also felt a little one dimensional and it felt overly orchestrated. This was probably 2.5 stars but I'll round up to 3 stars. “Moving Target” is another book in the current “new canon” of Star Wars novels released as lead-ins and tie-ins to the new movie “The Force Awakens”. It is written by Cecil Castellucci and Jason Fry, whose other contribution to the new canon, “The Weapon of a Jedi”, was mediocre at best. “Moving Target” is somewhat better than the previous novel but not by much. Set between “The Empire Strikes Back” and “The Return of the Jedi”, “Moving Target” follows Princess Leia as she leads a small group thr “Moving Target” is another book in the current “new canon” of Star Wars novels released as lead-ins and tie-ins to the new movie “The Force Awakens”. It is written by Cecil Castellucci and Jason Fry, whose other contribution to the new canon, “The Weapon of a Jedi”, was mediocre at best. “Moving Target” is somewhat better than the previous novel but not by much. Set between “The Empire Strikes Back” and “The Return of the Jedi”, “Moving Target” follows Princess Leia as she leads a small group through the galaxy on a secret mission. The rest of the crew---Luke, Lando, Chewie, and the droids---are absent, presumably on Tattoine planning a way to free Han from his carbomite prison in Jabba's palace. Like the previous book, Castellucci/Fry’s “Moving Target” begins with a framing device, set in the “current” time period of the new film. Leia is older, wiser, and somewhat sadder (which could be explained by certain unmentionable events in the new film), and she is being asked to record her memoirs. I’m not sure what purpose the framing device in either novel serves other than as a way to drop clues about the new movie. Unfortunately, the “clues” aren’t incredibly revealing, and they are wasted on those of us who have actually seen the film. Castellucci/Fry probably could have done away with them entirely without breaking up the narrative flow, but I have a feeling that some of the decisions about what to include and not include in the book were not entirely Castellucci/Fry’s. The story within “Moving Target” is ho-hum, at best. It introduces a few new characters, who may or may not have any relevance to the new movie. My feeling is that they don’t. Unlike Sarco Plank, who was introduced in “The Weapon of a Jedi”, and was featured in the new movie for almost an entire second (you can literally blink and miss his “cameo”), I don’t think any of the characters in “Moving Target” are mentioned or appear in the new film at all. I could be wrong. Perhaps I blinked during their scenes. Overall, the two books that I have read within the “new canon” have been disappointing, but it will not deter me from reading more. It does, however, cement my view that the “old canon” was some of the best writing within the Star Wars Expanded Universe. Perhaps it is because most of the old canon was not written for a young adult audience, which appears to be the target audience for the new canon. I have nothing against young adult fiction. Indeed, I think some of the best stuff is going on in young adult literature nowadays. I certainly have nothing against Fry’s writing abilities. The problem I have is that these two books by Fry read more like ad-copy and marketing ploys for the new movie than actual novels. For the most part, Lucas seemed to give the writers of the SWEU enough creative freedom to write what they wanted, within a wide parameter, of course. This is why authors like Timothy Zahn, Michael Stackpole, R.A. Salvatore, Greg Keyes, Barbara Hambly, Elaine Cunningham, Vonda McIntyre, Joe Schrieber, Michael Reaves, Aaron Allston, James Luceno, Troy Denning, Kathy Tyers, Kevin Anderson, and numerous others were able to write great books that consistently made their way onto bestseller lists and garnered huge followings of fans. That didn’t happen solely because the words “Star Wars” were on the covers. Lucas could have continued to publish crap based on current market research and target demographics, but the fans would have seen through that quickly. Instead, he picked talented writers and let them play freely in his sandbox. Now that's what I'm talking about! This story had real stakes and real consequences, and Leia had to make some difficult decisions. The best of the three new books about the OT trio. I also really liked that it acknowledged the trauma Leia experienced while imprisoned on the Death Star. Jos jedna zabavna pričica. Ali nekako najnaivnija od ove tri. Sama Leja je fino prikazana i njena unutrašnja borba i sumnje su dosta fino realizovane. Ostali likovi su zabavni ali dosta jednodimenzionalni, skoro karikature. Nije loše ali možete slobodno zaobići. Read more reviews @ The BiblioSanctum. 3.5 stars. Much like Smuggler’s Run, this story features an older Leia relating a story back to another party prior to the events in Star Wars: The Force Awakens. In this case, it’s a droid attempting to work on a memoir about one of the most important members of the rebellion. Set between The Empire Strikes Back and Return of the Jedi, Princess Leia is the last surviving member of House Organa, and finds herself learning to embrace a new role as a rebellion Read more reviews @ The BiblioSanctum. 3.5 stars. Much like Smuggler’s Run, this story features an older Leia relating a story back to another party prior to the events in Star Wars: The Force Awakens. In this case, it’s a droid attempting to work on a memoir about one of the most important members of the rebellion. Set between The Empire Strikes Back and Return of the Jedi, Princess Leia is the last surviving member of House Organa, and finds herself learning to embrace a new role as a rebellion leader with her diplomat status. Leia comes up with an ambitious plan to help the Rebel Alliance gain some time to bolster their forces and regroup, a plan that requires her to make tough choices as her role expands. Love, duty, and loyalty play a big role in Leia’s adventure. She finds herself conflicted between putting the needs of the people over the needs of the galaxy. She clings to her feelings for Han who has been captured by Jabba the Hutt while trying to reassure herself that she must think of the galaxy first. She comes to term with the fact that duty and loyalty don’t always mean being loyal to a cause over the people who support you–no matter if it is for the greater good. This is a fast story that any fan can enjoy. It balances the action with the story quite well, and I continue to be impressed that these books don’t treat their target age group as if they can’t understand the complexity of the morals and ideas these books are presenting. Also, this book includes a more direct Easter egg for Star Wars: The Force Awakens. This is the second book I’ve listened to with Jennifer LaVoy as the narrator. The first was also a Star Wars story set in the same canon (The Perfect Weapon). Even though I wasn’t bowled over by that story, I praised LaVoy’s excellent narration, and I have to do the same here. I can be particular about listening to books with characters from movies or games because it can be difficult for me to associate someone else’s voice with a character from a visual media. However, LaVoy’s narration has been my favorite so far of these books. This review has been hidden because it contains spoilers. To view it, click here. Leia: that entire ship of rebels was just sacrificed to protect me. I am sad. Me: I'm sad too. Poor Leia. Leia: To distract myself, I will mastermind a plan that will revolve around sacrificing a LOT of rebel sympathizers for the greater good! Leia: Hm a lot of rebel sympathizers are dying. That's sad. But I knew this would happen and it's for the greater good! Me: um O Leia: that entire ship of rebels was just sacrificed to protect me. I am sad. A great filler for the Star Wars saga. Perfect for kids with its tame language and avoidance of carnage. Mature readers would probably rate this lower, but the intended audience of 8-12 year olds will thoroughly enjoy this and thus receives a 4 star rating. I must admit I pilfered this from my youngest son's collection, a reward he received from our local library's summer reading challenge. These books are amazing! Especially this one. I loved the writing and it showed a different side of Leia which I found out that I really liked. The epilogue is spectacular and the drawings, done by a guy my mom knew, are so perfectly drawn it makes the book even better. Read this book! May the Force be with you! Star Wars: Moving Target - A Princess Leia Adventure is one of the four kids’ novels in the Journey to Star Wars: the Force Awakens series, and is therefore one of the earliest entries in the new canon. It tells the story of a covert Rebel disinformation mission involving Princess Leia shortly before the beginning of Return of the Jedi. The characterisation of Leia is spot on - an inspiring leader as well as a plucky adventurer who has no qualms about dispatching a stormtrooper in cold blood - s Star Wars: Moving Target - A Princess Leia Adventure is one of the four kids’ novels in the Journey to Star Wars: the Force Awakens series, and is therefore one of the earliest entries in the new canon. It tells the story of a covert Rebel disinformation mission involving Princess Leia shortly before the beginning of Return of the Jedi. The characterisation of Leia is spot on - an inspiring leader as well as a plucky adventurer who has no qualms about dispatching a stormtrooper in cold blood - she is a great central figure for the narrative. Still mourning the loss of the carbon-frozen Han Solo, she nevertheless itches for action in service to the Rebellion’s cause. So many previous novels have got Leia wrong, so it is refreshing to see her portrayal to match the movie character so well. As well as Leia we are reacquainted with the sullustan pilot Nien Nunb (who would go on to accompany Lando Calrissian in the cockpit of the Millennium Falcon at the battle of Endor), and also introduced to Lokmarcha, Kidi and Antrot. The trio of new alien characters (albeit species we’ve seen in the movies) make a good team, and a fine addition to the Star Wars canon, barely mentioned yet still shoehorned-in romance notwithstanding. The villain, Captain Khiome of the ISD Shieldmaiden, is uninspired, but serves her purpose in the book. She does get a nice karmic punishment, though. A minor quibble is that the novel is a bit uncertain in the timeline, and implies (albeit subtly) that Return of the Jedi happens very soon after The Empire Strikes Back, or at least the Rebellion finds out about the Death Star II very shortly following the Battle of Hoth. Nice touches for me included: the theft of a certain Imperial lambda-class shuttle; reference to the Bothan moon of Kothlis; and a couple of interesting and original planets (a tricky feat to pull off in a fictional universe as large as Star Wars. This was absolutely fantastic. Gave Leia some nice emotional depth while introducing compelling new characters and adding stakes that felt real. Highly recommend for someone who hasn't read any EU books who loves Leia and wants somewhere to start. The book is set between The Empire Strike Back and The Return of the Jedi. Out of the three new junior novels, Moving Target is the most complicated in terms morality, personal responsibility and sacrifice. After seeing people getting hurt while protecting her and learning about the existence of the second Death Star, Leia comes up with the plan to draw the Imperial forces to the other side of the galaxy so that the Rebellion can gather its forces in secret. She poses as a recruiter for the Rebellion. The problem is that her and her chosen group aren't the only one in danger: the people they come in contact with, people who help them, people who answer their (false) call all are. Leia struggles with all of this, but still makes hard decisions. Leia's team is interesting because it shows that, like Empire, Rebels are not uniform in thinking: some propose forgiveness if the Empire is defeated, some trials and executions. The story is framed with Prologue and Epilogue set near the beginning of The Force Awakens. Leia is (view spoiler)[General involved in ongoing war and Jakku and Poe Dameron are mentioned. (hide spoiler)] Excited! There were some things that were silly too (like tourist-y planet), but, hey, Star Wars. I enjoyed the book nonetheless. Moving Target is a middle grade novel focusing on Princess Leia and takes places between Empire and Return. The Rebel Alliance has just learned of the second Death Star, and they need a plan…and Leia has one. This story is rather short but it focuses on Leia’s plan to become a moving target for the Empire to focus on while the Rebellion readies itself for another go at destroying the power of the Imperial fleet. We also get to see Nein Nub, and three new characters help her along the way. Leia is Moving Target is a middle grade novel focusing on Princess Leia and takes places between Empire and Return. The Rebel Alliance has just learned of the second Death Star, and they need a plan…and Leia has one. 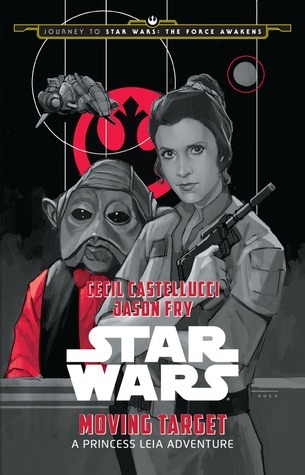 This story is rather short but it focuses on Leia’s plan to become a moving target for the Empire to focus on while the Rebellion readies itself for another go at destroying the power of the Imperial fleet. We also get to see Nein Nub, and three new characters help her along the way. Leia is still the strong-willed woman who can handle herself in a pinch, and I love that this is book meant for kids because they’ll get to see her do even cooler things than she did in the movies. She’s forced to make a lot of tough calls, and the book really focuses on the cost of the war itself which gives even more character depth to her and her companions as they struggle to cope with it. The pacing is excellent and I really loved seeing new worlds, and making lists of what I might see in the new movie. And to make things a bit less creepy in terms of the Luke and Leia thing, each book as clearly stated that they do care for each other and are close but are not in love…which the movies really could have cleared up BEFORE the last movie in the trilogy. I enjoyed this one more than Smuggler's Run: A Han Solo & Chewbacca Adventure, it had a bit darker feel to it (which makes it feel less YA-ish) and more known characters (well, some - Nien Nunb and Mon Mothma). It did get a bit too whiney at times though. "What a ridiculous sentiment. 'Adventures' is just a different name for 'terrible ideas'"
"But you can't let your grief stop you from living. I've learned that. We have to live for those we've lost so that their memories are kept alive through us. Particularly those who sacrificed their lives so we could go on." На 27 декември 2016, на 60 годишна възраст завинаги ни напусна актрисата Кери Фишър, изиграла безсмъртия образ на принцеса Лея в поредицата „Междузвездни Войни”. Макар, че за милиони фенове и киномани по света името й винаги ще се асоциира със Star Wars, Кери Фишър се изявява и като сценарист и писател. Смелата й и борбена героиня, вдъхновение за няколко поколения, ще продължава да живее на екрана, както и в многото истории от Разширетана вселена. Като последно сбогом с Кери Фишър, днес публикув На 27 декември 2016, на 60 годишна възраст завинаги ни напусна актрисата Кери Фишър, изиграла безсмъртия образ на принцеса Лея в поредицата „Междузвездни Войни”. Макар, че за милиони фенове и киномани по света името й винаги ще се асоциира със Star Wars, Кери Фишър се изявява и като сценарист и писател. Смелата й и борбена героиня, вдъхновение за няколко поколения, ще продължава да живее на екрана, както и в многото истории от Разширетана вселена. Като последно сбогом с Кери Фишър, днес публикуваме ревюто на една от книгите, посветени на извънекранните приключения на принцеса Лея. If this is what passes as a junior novel in the new canon, I am actually impressed and looking forward to reading more of them instead of shrugging them off as lower quality. This story delivers an entertaining party, a well-executed chase, moral deliberations and plenty of drama from start to finish. It does a fantastic job moving Leia from The Empire Strikes Back to Return of the Jedi, while making the rebellion appear diverse in motivations and outlooks, but united in a common purpose. A solid, If this is what passes as a junior novel in the new canon, I am actually impressed and looking forward to reading more of them instead of shrugging them off as lower quality. A really good story. I like the characterization of Leia and the connection to the movies is done well. Not very catching but a fast and easy read. An interesting and exciting space opera story...but with too much wasted space. I am fond of the Star Wars fictional universe: I have a nostalgic attachment to it (I still remember watching "a new home" as a kid at an outdoor movie theater on a hot Italian summer night), and despite some drops in quality along the way (e.g. The Phantom Menace), recent installments like Rogue One, The Force Awakens, and The Last Jedi are much better than the original series. Because of this fondness, I started reading some of Star Wars books. The quality of the ones I read so far has been, he I am fond of the Star Wars fictional universe: I have a nostalgic attachment to it (I still remember watching "a new home" as a kid at an outdoor movie theater on a hot Italian summer night), and despite some drops in quality along the way (e.g. The Phantom Menace), recent installments like Rogue One, The Force Awakens, and The Last Jedi are much better than the original series. Because of this fondness, I started reading some of Star Wars books. The quality of the ones I read so far has been, hem, not that great. I am told there are some very good ones (e.g. the aftermath trilogy), so i'll keep reading. Moving Target is one of the best star wars books I have read so far (but the bar was set quite low as I mentioned before). It bas been clearly written for a very junior audience (that made it perfect to read during my commute since it did not require my fully devoted attention), but it is entertaining and fun. Pretty good - felt like that maybe they could have taken out one of the planet missions, making it feel longer than it needed to be, but maybe in the end they all were necessary (which is why I'm not an author). One of Leia’s adventures between Empire and Return of the Jedi. The part with the bats nearly did me in. Ew!!!! Fun little read. A story set between Episode V and VI, about the preparations and mission leading up the battle of Endor. Cecil Castellucci is an author of young adult novels and comic books. Titles include Boy Proof, The Year of the Beasts (illustrated by Nate Powell), First Day on Earth, Rose Sees Red, Beige, The Queen of Cool The Plain Janes and Janes in Love (illustrated by Jim Rugg), Tin Star Stone in the Sky, Odd Duck (illustrated by Sara Varon) and Star Wars: Moving Target: A Princess Leia Adventure. Her short Cecil Castellucci is an author of young adult novels and comic books. Titles include Boy Proof, The Year of the Beasts (illustrated by Nate Powell), First Day on Earth, Rose Sees Red, Beige, The Queen of Cool The Plain Janes and Janes in Love (illustrated by Jim Rugg), Tin Star Stone in the Sky, Odd Duck (illustrated by Sara Varon) and Star Wars: Moving Target: A Princess Leia Adventure. Her short stories have been published in various places including Black Clock, The Rattling Wall, Tor.com, Strange Horizons, Apex Magazine and can be found in such anthologies such as After, Teeth, Truth & Dare, The Eternal Kiss, Sideshow and Interfictions 2 and the anthology, which she co-edited, Geektastic. She is the recipient of the California Book Award Gold Medal for her picture book Grandma's Gloves, illustrated by Julia Denos, the Shuster Award for Best Canadian Comic Book Writer for The Plain Janes and the Sunburst Award for Tin Star. The Year of the Beasts was a finalist for the PEN USA literary award and Odd Duck was Eisner nominated.